Working together every step of the way. With 37 Toyota dealers that span from Dawson Creek to Cranbrook, BC through Alberta, Saskatchewan and Manitoba to Kenora, Ontario – Prairie Toyota is your choice for the latest in Toyota vehicles. We take pride in being a part of our local communities and that’s why we're so excited to be a part of events like our Toyota Free Ride event with Sunshine Village. Welcome to the future of freeskiing and snowboarding. From park and pipe to big mountain, Salomon's progression continues faster than ever. Collaborating with the world’s best athletes allows us to continually evolve and constantly expand what is possible on snow. Molson Coors Light remains one of Canada's fastest growing beer brands due to its ice cold, easy drinking, Rocky Mountain taste. 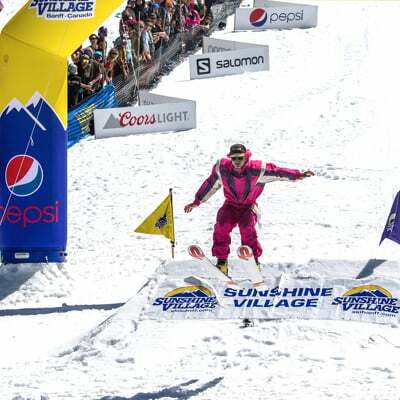 The Silver Bullet is also a major sponsor of adrenaline sports in Canada, and is proud to support Sunshine Village. The members of the Coors Light Brewing Company hope that you enjoy the season and remind you to "Come for the mountain and stay for the party!" The Pepsi Bottling Group, or PBG, generates nearly $14 billion in annual sales. It operates in the United States, Canada, Greece, Mexico, Russia, Spain and Turkey, accounting for more than one-half of the Pepsi-Cola beverages sold in North America, and about 40 percent of the Pepsi-Cola system volume worldwide. The PBG sales force of more than 30,000 customer representatives sells and delivers nearly 200 million eight-ounce servings of Pepsi-Cola beverages per day. PBG Canada is headquartered in Mississauga, Ontario with our Western Regional office located in Calgary, Alberta. ROCKSTAR ENERGY DRINK is available at Sunshine Village and are proud sponsors of the Great Divide Terrain Park. Constantly pushing the limits, let us show you what it's like to PARTY LIKE A ROCKSTAR! Sunshine Village supports the development of current and future Olympic, World Cup and world championship athletes through programming and events aimed at producing the best alpine, para-alpine and ski cross athletes in the world. We hope that you will consider support of Alpine Canada, and your important contribution will assist Alpine Canada athletes by making it possible for each of them to achieve their goal of being the best athlete in the world! Sunshine Village and Alpine Canada are committed to getting Canadian youth active and healthy in winter! Your support of Alpine Canada will assist in getting more kids involved in skiing programs this winter. Thank you for your support of ski programming in Canada! Proudly serving our communities has been a long standing Safeway and Sobeys tradition! We are pleased to provide fresh and healthy food to Canadians from coast to coast, and encourage an active lifestyle through participation in sports including our partnership of the Sunshine Village Free Rider program.